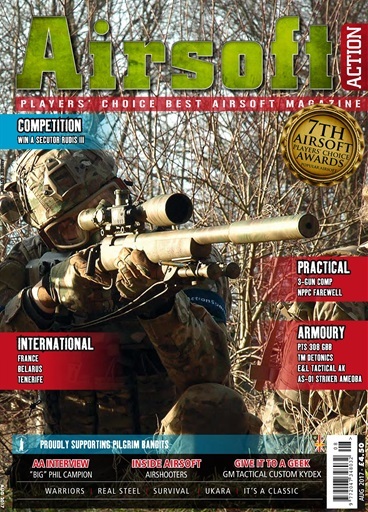 Issue 77 of Airsoft Action has a bit of an "International Flavour" with reports from three different countries; France, Belarus and the sunshine island of Tenerife. For weapon reviews we take a look at the excellent PTS 308 GBB, E&L's stunning AK74UN, the Amoeba AS-01 Striker "budget" sniper and "The World's Smallest .45 ACP", the Detonics Combat Master from Tokyo Marui. 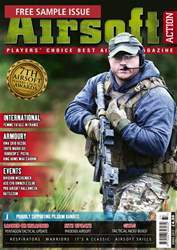 We always try to make every issue "a good read" and Issue 77 is no different, with a wide variety of articles; from "Old Blokes and Airsoft", to a "What if?" Soviety Threat at a real Secret Nuclear Bunker and coverage of not one but two Practical Shooting competitions - we even have an exclusive interview with former D-Squadron 22 SAS trooper, "Big" Phil Campion, as Kelly "Femme Fatale" Hardwick visits "The Foundry", a new CQB site in Leeds. On top of that are all our regular columns and features, including an IWA "Wrap Up", Warriors, Its A Classic, Give It To A Geek, Real Steel and Inside Airsoft, where this month we talk to "Airshooters", a company in Essex with big plans. Paul Yelland tells us how to create an ideal "Get You Home" bag, while Frenchie explains why UKARA's involvement with The Policing And Crime Act 2017 has been so important to airsoft in the UK. Then, to round everything off, by answering just one (very) simple question, you can WIN the SECUTOR RUDIS III we reviewed in the last issue. Now that's what we call a packed publication - and that is why players voted Airsoft Action THE BEST AIRSOFT MAGAZINE!